Creates a continuous acoustic image of the borehole split along the north axis presented in a two dimensional graph. Features such as fractures and bedding planes can be determined by dip angle and dip direction. 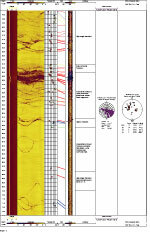 Image is corrected for borehole deviation and true north. Analysis can provide various depictions of data (e.g. Rose Diagrams, Polar Plots, Frequency, etc). Sonde is run in fluid-filled borehole of either mud or water. Useful when core retrieval is not 100%, or no core is retrieved. 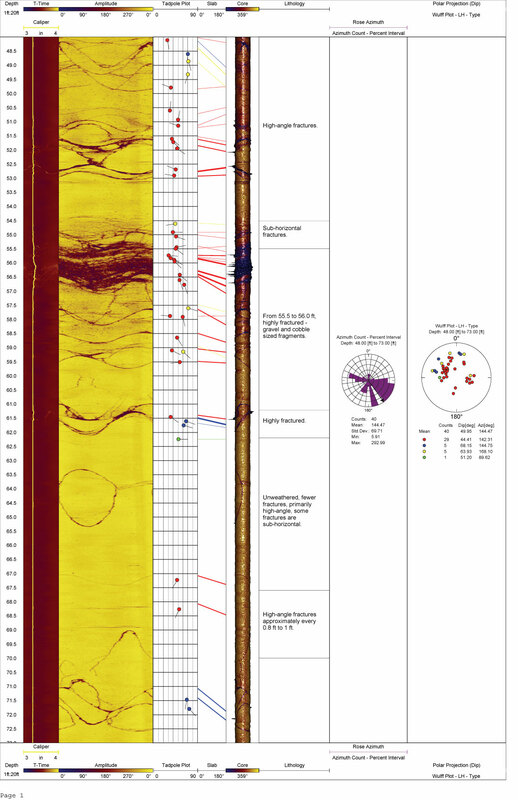 Click on thumbnail for a larger image of the ACOUSTIC BOREHOLE TELEVIEWER LOG sample log.